Shell Lace Structure is a technique inspired by nature. Seashells gain strength from optimised curvilinear geometry, locking in stiffness with corrugation. Lightness is achieved through perforation, creating highly-efficient and responsive structures with minimum weight and wastage. 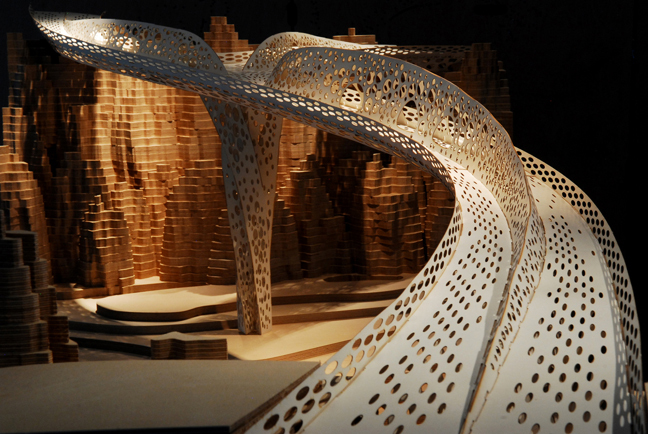 The technique has been developed through research and experiment with digital modelling, digital analysis, and digital fabrication tools. The design process is intuitive, analytical and iterative. 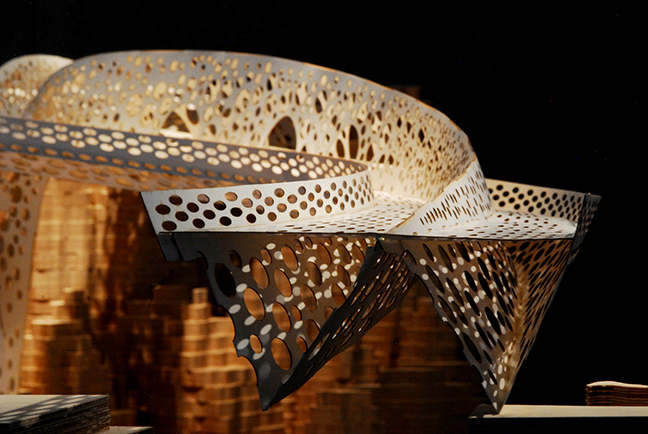 Three-dimensional geometries are built up virtually from conjoined developable surfaces. These surfaces are unzipped at the seams, unrolled and nested allowing efficient computer aided cutting from a flat sheet material. The cut profiles are reassembled to create the final three-dimensional form. Shi Ling Stone Forest in Yunnan, China, provides a dramatic natural backdrop to demonstrate the shell lace principles learnt from nature. This lightweight bridge spans 75 metres using a single sheet material of 15mm thickness. The structure is composed of three asymmetrical arches that spring from a single supporting column and three triangular torsion beams that form the curving routes. 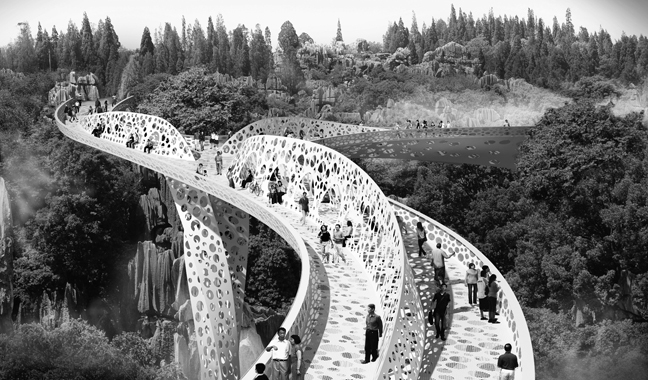 The bridge provides views and high-level pedestrian and cycle access across one of many valleys through the vast limestone karst landscape of Yunnan.